One of the most important changes that an angler needs to make in switching from fresh to saltwater fly fishing is to the leader which joins the fly line to the fly. Saltwater fish species are much larger than fresh, more powerful and live in terrain that is likely to damage a leader. Oyster shell encrusted rocks and horse mussels take no prisoners. In New Zealand, the general practice is to use a single 2 – 3 metre length of 7 – 10 kilogram monofilament as a leader when fishing for larger pelagics, such as kingfish. 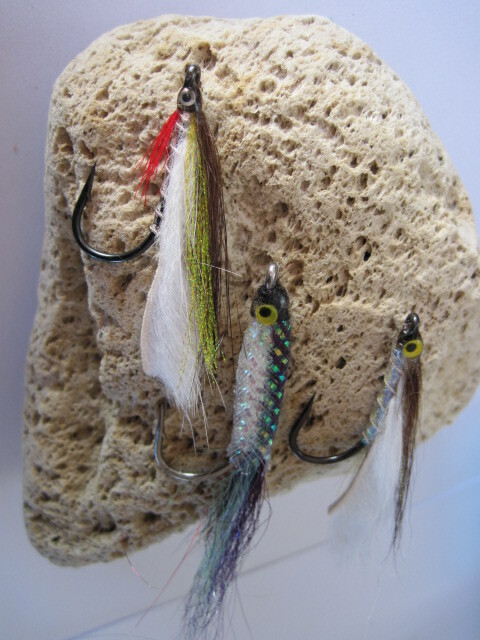 This works well as the flies used in saltwater are generally larger, bulkier in profile and heavier than those cast to trout and this additional mass helps turn the leader over during delivery. However if the fish are feeding in calf deep water and presentation is critical then it is better to change to a tapered leader. Tapered leaders work well as they help to turn the fly over in the forward cast and deliver the fly without excessive splashing. Trout fisherman are well aware of the reasons for this. 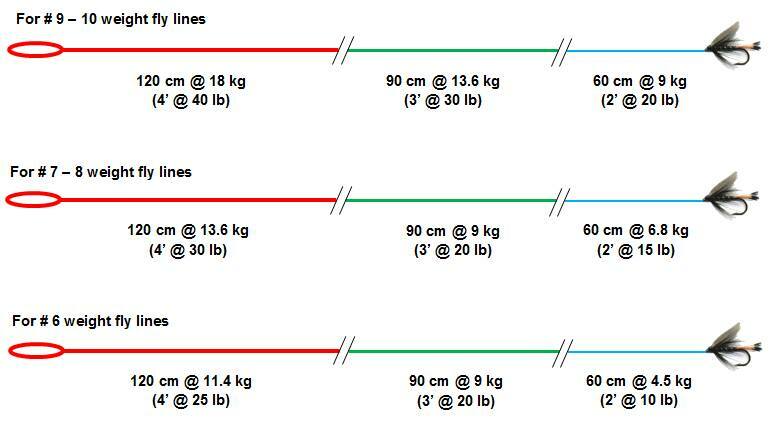 Ed Mitchell in his book “Fly rodding estuaries” summarises the traces he uses for different weight fly lines. I’ve prepared an image to showcase his recommendations below. The double lines which bisect the leader represent the knot points. He uses a loop knot to attach the leader to the fly line. My preference is to use a Lefty’s loop for this. Mitchell also recommends using the same brand nylon monofilament for leader construction (e.g. Maxima Ultragreen) and joining each section of line to the next with a double blood knot. If you decide to use brands of nylon or fluorocarbon from different manufacturers then he recommends joining them together with loop to loop knots rather than double blood knots. The reason for this is that each brand of monofilament will have unique characteristics (elasticity, rigidity and rate of deformation) and joining the sections of different material together with a double blood knot can lead to twisting. The loop to loop connection counteracts this phenomenon. I like to prepare a couple of spare leaders for each fly line weight and store them in labelled plastic bags in my fishing vest or pack. Then, if my leader gets damaged during a session it is a simple exercise to select the correct replacement leader and attach it, via the loop. I also use pre-made Blue Sky furled leaders and Airflo polyleaders if the estuary is relatively free of obstructions. However, when the estuary is gnarly I revert to Mitchell’s recommended leaders below. Good point, well made. You do have to step up the weight when fishing in gnarly terrain.